Duo is a modern and simplistic interpretation of a traditional coatrack. It consist of two parts that you can use for the base of your needs. Longer garments can be hung on the upper part and smaller ones on the lower part. The idea of the Duo is that it can also be used as a towel rack. It fits in public spaces as well as in home environment. 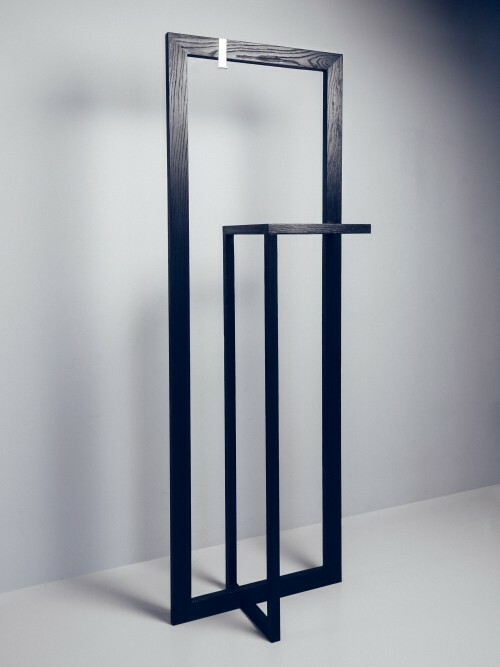 Duo measures 180 cm × 60 cm × 35 cm and it is made out of oak. Black finishing is created by burning the surface, and wood oil gives it a slight gloss and protects it. Burning and oiling the wood makes it withstand water, so Duo coat rack can also be used in humid spaces, such as saunas and locker rooms. Download high-resolution pictures here. Please contact Hanna Särökaari when publishing these materials.